Quick release couplings are used to connect and disconnect components of compressed air systems. In general, coupling parts consist of a pair of mating halves, which include the plug and the coupler. The working of common quick release coupling uses the push-pull principle. When the plug is pushed into the coupler, it is securely held by a self-locking mechanism, which results in start of flow, leak proof connection and disconnection. 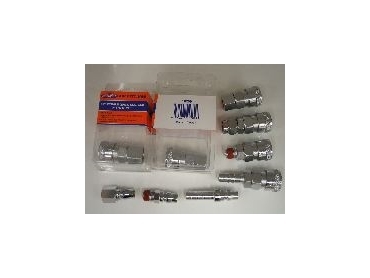 The advantages of using quick release couplings including quick and effortless connection and disconnection of compressed air system components, air loss reduced during connection and disconnection, and increased control of compressed air supply. AIRSUPPLY quick release couplings are compatible with most mainstream types of couplings found in Australia and are available in bulk or double blister package. Bulk quick release couplings are ideal for heavy compressed air users who need to replace compressed air consumables frequently. The double blister packaged quick release coupling is bar-coded and labelled with item description and features, which is ideal for shop front. AIRSUPPLY is a dedicated brand to serve the compressed air equipment market. Our range is continuously growing so as to achieve our aim of providing one-stop shopping experience for all compressed air equipment needs at competitive prices and without compromising quality. AIRSUPPLY is brought to you by LINKRISH PTY LTD, a company dedicated in supplying tools and machinery directly to the Australian market. LINKRICH is Australian owned and is dedicated to the Australian market.